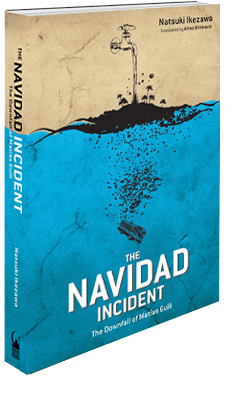 ﻿ THE NAVIDAD INCIDENT: THE DOWNFALL OF MATÍAS GUILI « Haikasoru: Space Opera. Dark Fantasy. Hard Science. In this sweeping magical-realist epic set in the fictional south sea island Republic of Navidad, Ikezawa gives his imagination free rein to reinvent the myths of the twentieth century Japan. The story takes off as a delegation of Japanese war veterans pays an official visit to the ex-World War II colony, only to see the Japanese flag burst into flames. The following day, the tour bus, and its passengers, simply vanish. The locals exchange absurd rumors— the bus was last seen attending Catholic mass, the bus must have skipped across the lagoon— but the president suspects a covert guerrilla organization is trying to undermine his connections with Japan. Can the real answers to the mystery be found, or will the president have to be content with the surreal answers? The Navidad Incident is here! Natsuki Ikezawa (1945-) was born in Hokkaido. As a young man, he quit school at Saitama University to become a poet. He lived in Greece for three years in the mid-1970s. Presently, he writes both fiction and criticism, and is an active public speaker. Of Ikezawa’s works, Still Lives and A Burden of Flowers are available in English, and the Jun’ichiro Prize winning The Navidad Incident: The Downfall of Matías Guili has been translated into German. It’s late at night in the President’s private apartments. All is quiet. Outside, the night sky swirls with stars, but the only ones who’d care are fishermen eager to read next morning’s weather conditions. As ever, the beauty of nature bores the locals. President Matías Guili sits on the sofa and mulls over the afternoon’s events. Earlier in the evening, he visited Angelina’s for a small snifter of cognac and commiseration, too preoccupied for much else. It’s been one hell of a hard day. Today’s events call for otherworldly insights, the kind a spirit he knows can provide. He must summon him properly but can barely bring himself to say “Lee Bo,” the ghost of a name. He rises from the sofa to fetch a candle, which he lights with the seldom-used coffee table cigarette lighter and places in the equally clunky ashtray beside it. Then he gets up again and turns off the room lights. No drafts enter the room, yet the flame wavers briefly before coming to a stable pinpoint of illumination. As age increases, so does ceremony. He looks at the candle and shakes his head; nothing but protocol lately. Politically, he pretends to tackle each and every situation, but it hardly takes more than a superficial mental swish. Real judgments are rare; he merely moves from ceremony to ceremony. Not once in the last year has he actually had to shift out of autopilot. Probably the last time was that Tamang decision. And he wonders why the days are so monotonous? The flame stays perfectly still, not a flicker of movement. He stares until all thought settles like ash. Presently the flame appears to flare. He strains his eyes, then looks up to see sitting there before him…Lee Bo, glowering head-on. Matías nods. The apparition nods back.